Are you the kind of person who has found it difficult this summer to make time to simply lounge by the pool and just enjoy yourself? Do you keep telling yourself that this will be the weekend you spend at the pool and yet, somehow, Sunday comes around and you haven’t even pulled your bathing suit out of the drawer? If ever there was a time to make the most of summer, it is this weekend! That’s because this weekend is the annual Riverwood Resident Pool Party. And trust me, you don’t want to miss the festivities! 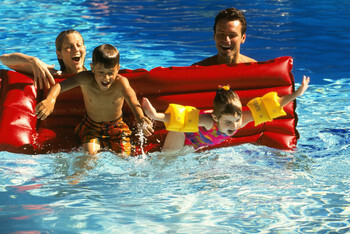 Attention Riverwood Residents: Prepare For a Weekend of Fun in the Sun in Clayton! The fun kicks off at 10 a.m. this Saturday, August 23, at the Rivewood Athletic Club. Imagine a fun-filled day where you can eat all the delicious food you want, play some family-friendly games with the kids and enjoy some energizing music. Meanwhile, you’ll also have the time to chat with your neighbors and catch up on what you’ve both been up to over the summer, perhaps sharing precious family memories you made on your respective summer vacations. Just consider our annual pool part your personal excuse to simply relax, unwind and enjoy life this weekend! After all, you deserve it! Who wouldn’t want to live in the Riverwood Athletic Club of Clayton? From our exquisite single-family homes to our endless list of recreational amenities, from our fantastic location within Clayton to our easy access to nearby amenities – it’s impossible not to love life when you live here! If you’re interested in making this community your home, please contact us at Fred Smith Company today. Who knows – maybe we’ll catch you at next year’s pool party!